Does fall and the start of school remind you of favorite childhood books? Do you remember reading The Very Hungry Caterpillar by Eric Carle? The story is about a caterpillar that eats lots of different food before entering his cocoon and becoming a butterfly. The food he eats helps him to complete metamorphosis. If you have a compost pile, it is going through its own metamorphosis. The food and plant scraps you put into the bin or add to the pile are transformed into loose soil over time. Much of this transformation occurs thanks to microorganisms, such as bacteria and fungi, and macroorganisms, which are large enough to see. 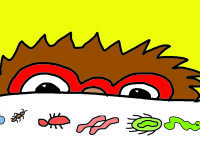 Like the Very Hungry Caterpillar in the story, the macroorganisms eat all the different scraps and are still hungry! These worms, ants, spiders, beetles, millipedes, flies, and other bugs eat bacteria, fungi, and sometimes each other, as well as digging, chewing, ingesting, and mixing yard debris and other organic materials. As they eat, they create compost, which looks like soil and is filled with nutrients. Even larger creatures, such as frogs and snails, come to help by snacking on the smaller organisms. Thanks to the hearty appetites of the macroorganisms, a compost pile is transformed into something new, just like the Very Hungry Caterpillar! If you don’t have a compost pile yet, fall is a great time to start–with the help of some very hungry macroorganisms! Need help? Read our post on how to compost with food scraps or visit How to Compost to get started.